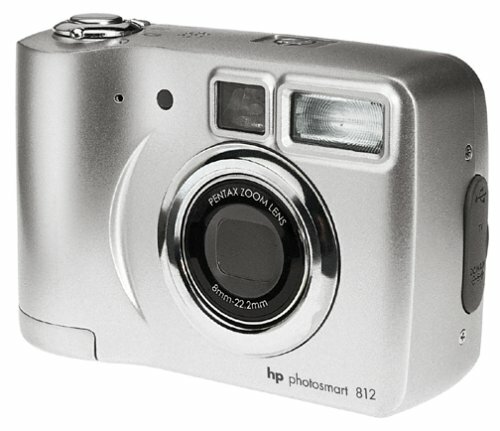 The HP PhotoSmart 812 is a well-specified 4-megapixel digital camera with a Pentax 3x optical zoom lens. 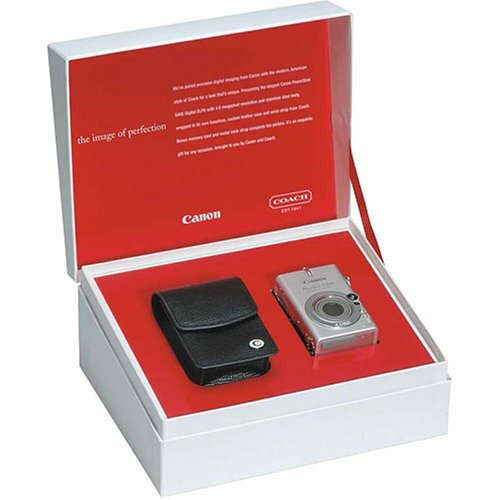 It's designed as a simple-to-use point-and-shoot replacement, and comes in a compact case with silver finish. While lacking any dramatic aesthetic impact, it does possess neat lines and has an overall feel of a well-constructed camera. The controls on the HP 812 are straightforward. A power button is accompanied by a shutter button on the top of the camera, the latter surrounded by a mode-select wheel. This enables you to choose between video mode with audio, a time-lapse mode, or straight camera mode. On the back you find zoom controls, located where your right thumb naturally sits. The 3x optical zoom is complemented by a digital zoom to provide 21x total magnification. However, quality suffers when moving to the digital zoom, as with any digital camera. The menus found via the LCD are straightforward to navigate. You can amend the quality of pictures taken, from one to four stars, with the latter providing 4-megapixel images suitable for print enlargements. The image quality produced by the PhotoSmart 812 is impressive by typical digital camera standards. However, when stacked against competing 4-megapixel models it doesn't compare favorably. The depth of field is quite shallow, with only small areas of the picture in focus. The autofocus also struggles in low light. This said, it is worth remembering that other 4-megapixel cameras are often considerably more expensive than the 812. The HP 812 is designed purely for ease of use and you can configure your images while on the camera to print or e-mail, thanks to the Instant Share technology. This is best served when used in conjunction with the HP camera dock, which is not supplied. This separately available dock enables you to easily share pictures and charges your camera batteries at the same time. The batteries supplied with the camera are nonrechargeable lithium-ion, which have a decent lifespan. The camera will also take standard AAs in an emergency, but you'll only get limited life out of these--around five minutes before the LCD powers down. We recommend getting a set of rechargeables, like those supplied with the camera dock. The HP 812 uses a Secure Digital (SD) card memory for image storage and is supplied with a 16 MB card. More memory will be needed, as the supplied card will only store five pictures at the highest quality. The camera will also take MultiMediaCard (MMC) memory, which is cheaper than SD. I take a lot of pictures! I have 30 or so picture albums on line on Webshots. These are by far the best pictures I've ever seen. When you enlarge the picture the details stay sharp and focused! It's light enough to keep in my shirt pocket. The zoom is outstanding. The docking station makes recharging and downloading a snap! I would like a car charger. I have not looked for one yet, but I'm sure there is one out there somewhere. This little puppy even makes big movies! It's a work-horse in a small package. It is very easy to learn how to use. I never even opened the manual that came with it. You will love this camera! Decent- But only for outdoor still pictures! I Previously owned the HP Photosmart 320, a decent 2 MP camera. I am somewhat dissapointed with the Photosmart 812. Anyone buying the PS 812 should be aware that there is a one to two second delay between the time that the shutter button is fully depressed untill the picture is actually taken. I've gotten tons of shots of the back of my baby's head- She'd turn by the time the camera actually took the picture! The images taken indoors are slightly off color and faded compared to my other cameras- seems to be the way the flash reflects off objects.The movie mode with sound is decent, and the outdoor pictures are fairly sharp. Even so the camera doesn't do that great of a job focusing. as mentioned in the other posts, the 812 is powered by 2 AA batteries, so even two NIMH rechargeables don't last more than 40 shots or a few minutes f movie mode. HP mentions in the manual that you must conserve the batteries, but many of the other companies out there get 300 to 800 shots on their baterries, so the 812 really cant be considered acceptable. Overall I'm thiking of switching to a Cannon. The Cannon line of cameras seem to actually take a picture when you click- and they don't have a 4-5 second delay between shots while the previous picture loads to memory. Plus theres no nedd to chage the batteries every few pictures. HP definitely needs to get their act together. Les cuento que compre mi cámara HP812 en Amazon.com, me funciono regularmente, y ahora resulta que tiene una falla en el lente y pregunto al centro autorizado de soporte HP en mi país y me indican que si pueden arreglar la camara con un mantenimiento normal, perfecto!. Sino perderé mi inversión, por que HP no tiene repuestos para sus cámaras digitales a nivel mundial. Esto me desconcierta, por que siempre había confiado en esta marca, tengo muchos productos de ellos, y ahora estoy a punto de perder muchos dólares por su culpa. Les recomiendo revisar otras marcas que si tengan un verdadero servicio al cliente, esto no es servicio al cliente, es la comercialización de cámaras "desechables", las vas a tener que cambiar tu cámara en 1 o 2 años. Triste no? para una inversión de tanto dinero. Saludos, espero que te sirva mi experiencia al momento de tomar tu decisión, ahora me tocará comprar mi 3 cámara (las dos anteriores fueron HP), pero seguro no será HP. Well I have this photosmart 812 camera and a C8881a dock. I thought it would be a good combo since it came with two sets of batteries and easy connectivity to my computer. Seems to have nice menu's and iPhoto recognizes the camera right away. Windows XP brings it right away as well in drive mode. The batteries that came with the camera will not charge. According to HP the camera will not charge if the batteries less than 1.2v in them. Well of course new batteries out of the box will have less than 1.2v in them!!! HP says to upgrade the firmware on the camera which will fix this issue, but it still does not work! Another annoying thing is that you need to reset the date everytime you take the batteries out, or in this case whenever you unhook the camera from the dock since the batteries never charge! The Kyocera S4 packs a load of features into a digital camera that slips comfortably into your shirt pocket--it's barely over 3 inches wide and weighs less than 6 ounces. The 4.3-megapixel sensor captures sharp and vibrant images with a resolution of up to 2,272 by 1,704 pixels, which means you can create prints up to 11 by 14 inches in size without compromising quality. The lens has a 3x optical zoom sufficient for most purposes, and the 2x digital zoom yields a total zoom of 6x and opens up more photographic possibilities. I got the Kyocera S4 back in January 2003. Great "unkown" digital camera. 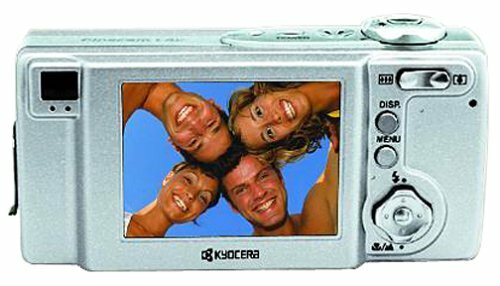 For anyone who is doubtful of the quality, you should know that Kyocera makes digital cameras for Toshiba, and they are the parent company of Yashica and Contax, two of the most respected names in photography. The design of this camera is simply beautiful. Gorgeous gun-metal aluminum body, solid zoom lens with built-in cap, simple button and menu layout, and overall, a very durable camera. As this was my first ditial camera, I quickly learned the limitations of the unit. Some of the limitations can be corrected through simple upgrades, namely, the 16MB SD card included with the unit is not adequate for most users. You should get a 64MB or 128MB card so you can save more than 80 shots at a time. In fact, with a 128MB SD card, you can shoot over 170 photos at high resolution. It might be all the storage you're going to need with a simple camera like this. Also, I recommend getting the deluxe leather case with belt-clip (available from Kyocera or other camera shops), as the pouch included with this camera will not provide enough protection - even for such a durable device. This camera competes with the Canon Elph and other "credit card" sized cameras (the front of this camera is precisely the size of a credit or ATM card). And it competes with them very well. The resolution is incredible, and the optical zoom is rock-solid. However, using the digital zoom does result in a loss of resolution (which may not be known to first-time digital users). And this camera has useful manual exposure and CCD sensitivity seetings, but no true ISO or "traditional" shutter speed adjustment. Also, this camera does not perform well in low-light or in taking shots of fast-moving objects. As much as I have experimented with its settings, it is obvious that this camera cannot do what the high-end digital cameras can do in twilight settings outdoor and dim settings indoor. Even shots of hockey players on a brightly lit ice surface required precise manual adjustment (and a lot of patience). This is a camera for daytime landscapes and close-ups of people and objects. It cannot compete with digital SLR's or rangefinders costing twice as much (or more). But having said that, I believe it is better than the Cannon Elph, and most other digital cameras of the same size. Battery life is not spectacular. If you use the flash for most shots, expect to re-charge the unit every 20-30 shots or so. I even got a spare battery, just to be sure I was never caught without a charge for the flash. The Kyocera S4 fills an interesting gap between the anonymous entry-level devices and the high-end units. It's best feature might be that it packs 4 megapixels of resoultion into a form factor the size of a deck of playing cards. That alone is a huge advantage. Even worn on a belt, it is no more obtrusive than a cell phone. If you need a camera that can fit in your bag and always be available without getting in the way, or if you need a camera for building a web site, selling items online, or just getting into digital photography, this is the only camera you'll need. Now that I am happy with the Kyocera S4, I am ready to take ditial photography to the next level, and I think that will be the Leica 1 Digital. It has many of the same features as the Kyocera S4, except that it has a larger LCD, a bigger lens (to let in more light), an ISO dial, and longer battery life. But I expect to get thousands of quality shots with the Kyocera S4 regardless. It is not just another point & shoot camera. It is a great value. 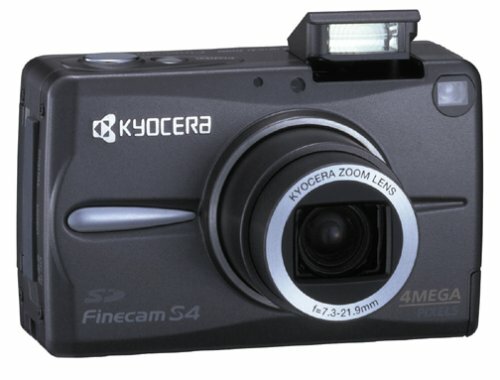 The Kyocera Finecam S4 is a truly remarkable little point-and- shoot. I am a serious photographer, owner of high-end Canon film cameras and "L" lenses (not used since buying the Kyocera S4). It is a point and shoot, rather than a professional camera, but the resolution is incredible, even at the lowest (normal) setting. The color has been just phenomenal. I have had it for about three months and am extremely satisfied and am thinking about buying the S5 when it appears. I recommend getting at least a 64-meg. card, rather than the skimpy 16-meg card provided. The LCD screen is hard to see during bright sun, but you have the option of using the viewfinder. In low light, there is a delay while device meters and focuses, but this is true of all cameras. It could mean missing the shot--but you don't have to wait for your film to come back to know you missed it. I am addicted to the instant feedback. It has made me a better photographer. The video function is low-end, but basic. No audio, but if you want a video camera, buy one, rather than compromise a good digital still camera like this one. It is tiny and fits on a belt not unlike a beeper. I am never without my little companion and feel naked when it is not on my belt. For the convenience, the size and the features it is packed with, you can not do better in my opinion. really compact, good stills, but no audio! 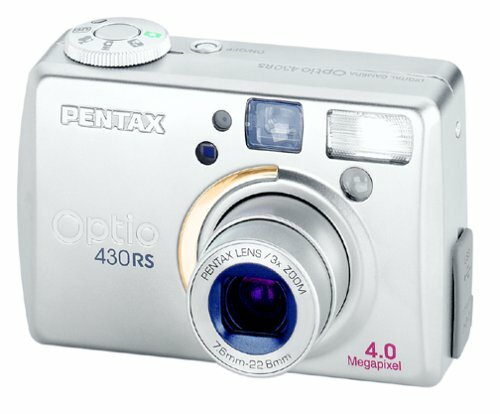 Take razor-sharp and brilliantly colored digital photos with the Pentax Optio 430RS digital camera. Its 4-megapixel sensor is capable of resolutions of up to 2,301 by 1,712 pixels, which can produce quality prints from 11 by 14 inches to poster size. Sitting comfortably in your hand and encased in a stainless-steel shell, the 430RS has a 3x optical and 2x digital zoom for a total 6x magnification. Take pictures effortlessly with the autofocus, autoexposure, and autoflash systems, or you can switch to manual settings for more artistic control. Several shooting modes are available for a variety of creative choices, such as standard, night scene, and metered manual. The movie mode records movie clips of up to 30 seconds. Digital-filter mode changes the picture tone to colors like sepia, red, and monochrome. A 3-D image mode gives photos a sense of depth and perspective when viewed with the included 3-D viewer. I really like this camera. I have been using digital cameras for several years now and this one is easy to use and takes great pictures. The most important thing for me was size - I found that unless I could put the camera in my shirt pocket I rarely took it with me. This on is only slightly bigger than a pack of cigerettes. You need to buy a compact flash memory for it if you are going to take high resolution pic's as you can only get something like 8 of the highest res pictures. The battery is a strong one and will run for a long time, and one ought to have a extra - but finding one of these new lithium ion batteries has not been easy. You can even zoom in on a picture you have taken while reviewing it. This camera may have 4 MP resolution but it has low definition and is one of the noisiest cameras I have ever seen. My old 2MP coolpix 950 looks much better. Exchanged it for the 3.2MP Canon Powershot A70 today. The Optio takes true 4MP pictures, which are good for enlarged prints. The image quality is good, with decent colors and slightly soft edges. (I personally don't like sharp edges anyway.) The form factor makes it easy to hold, and the 3X optical zoom is fast and accurate. You can use either the LCD viewfinder or the optical viewfinder, the latter saving you considerable battery life. A solid product that I think you'll like. Do look around for the best price. This is an excellent 2 megapixel camera! I found this camera extremely easy to use! The learning curve was almost inexistant. Althought there is only 6 exposure modes on the dial, I found that it was much easier to use than other cameras with 10-15 modes. You can set it with just a glimpse. However, the honeymoon ended when i looked at the pictures upclose. Even when taken on a bright sunny day, pictures never achieved 4 megapixels of sharpness, more like 2 megapixels. Under lower lighting conditions (cloudy day), you could easily see noise. Also JPEG were a rather big (usually around 2600 KB) considering their lack of detail, but that was a lesser problem. In the end, i had a really hard time deciding whether i should return it or not, but i finally did. There's no point in buying a 4 MP camera, if it produces 2 MP worth of quality at twice the price and more than twice the filesize (twice less pictures on a flash card), no matter how cute and easy to use it is... So i went ahead and bought a top of the line (but still compact) Canon Powershot S45. Althought it isn't has userfriendly, it give you 4 MP worth of picture. 1. The most important, end point - picture qulity is disappointing. For 15x10cm size pictures it is still OK (then rather buy 2MP camera and save). Digital noise is high esp. when max resolution is used. Noise is easily seen even on pictures taken under direct daylight, never mind lesser light. Compared picture quality with 2MP Nikon Coolpix 2500 - no comparison. 2. Flash range 2 meters. Focus light <1 meter range. 3. Auto white balance recognises only daylight, the rest must be done manually. 4. Picture freezes while camera "slowly" adjusts focus. As the result your object might be gone. Poor light sensitivity (ISO"max"-200), ie. slow or no focus if light is poor. 5. Strange JPG compression system - files are mutch large then taken with other cameras with the same resolution and compression degree. Higher capacity CF card required (but where is the quality for a bigger file size?). 6. Features like "3D pictures" and "Colour filters (to make yellow, blue etc. pictures)" ... Who needs it??? 7. No TV/AV output, no sound recording, no speaker, battery needs to be removed for charging, charging time 2hrs. My wife bought this for me as a present. I dropped it. They sent me a new one. No hassle. Easy to use picture are very good quality and for 10 to 15 bucks a rechargable battery setup makes this an excellent point and shoot. This camera's 3x optical zoom worked well and it took good pictures inside and outdoors however they did not appear to be any sharper than the pictures I got with a $98 3MP Vivitar. The Vivitar did not have 3x optical zoom or macro capability which is a definite plus on the Samsung 420. On the more negative side for the Samsung, and the main reason for just two stars; a new set of alkaline batteries lasted less than one day, taking only about six pictures. That was with trying to minimize my use of the LCD display to conserve batteries. I have been very leery of digital cameras as the picture quality of some that I've tried ws not so great. This camera changed my mind! I found it on clearance and paid only 129.00 for it so the price for a 4mega pixal camera was excellent. Not only is it extremely easy to use but the pictures are awesome. FAr better than the 35mm that i have been using. It also has the capability to do video w/ sound which is very cool. The only drawback is that it goes through batteries (AA) like crazy. Invest in rechargable batteries if you buy this one. Extremely easy to save your pictures to your PC also. This is one great camera! Great Pictures, Easy to Use! I had a problem with another camera's proprietary charger...so off to the camera store I went! I ended up with this camera--turns out I was lucky! It uses AA batteries, not a problem if you use rechargeables. The interface is good--I had it figured out in minutes (manual is quite good, though). But the pictures--excellent! I took some of a museum exhibit--lots of lights at odd angles, lots of glass and reflections. The pictures were wonderful! I also did some at night and outdoors--all came out substantially better than average. 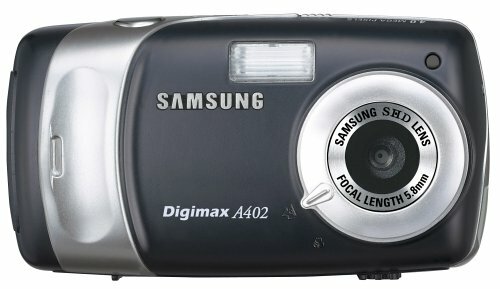 The Samsung Digimax V4 (a slight variation of this camera) was by far one of the best overall digital cameras I'd seen when I was researching cameras to buy, and I'm very glad I purchased it. The thing that made it stand out the most from other cameras was the battery usage. I've heard of some digital cameras using their batteries really quickly, but the batteries in this camera can last me a full day of photo taking. It can take several kinds of batteries, AA x 2, Lithium, and more. When I come home after a full day of taking pictures and pull them up on the computer, they look so clear and beautiful-every time it seems my jaw drops, the quality is amazing. Even a friend of mine who is very knowledgeable of cameras told me that he was stunned at the quality of the JPEGs I was showing him that I'd taken. Not only that, but when you go to the max zoom (which makes use of the digital zoom, which technically just "crops" the picture and enlarges it), the picture still looks just as clear as the normal pictures that didn't make use of the zoom. Something that doesn't usually get mentioned is the lens company. The lens company that makes this camera's lens is Schneider-Kreuznach, a company that's famous for its quality in lens making. Because of this quality, this camera might possibly give you overall better looking pictures than a camera that has perhaps 5 Mega-Pixels. This is a great buy for beginners and those who love taking quality pictures. There's plenty of information about this camera all over the internet- this should definitely be considered if you're looking for a great camera at a reasonable price. The camera is very user friendly, my 3rd digital camera and this is the most user friendly I have seen yet. Both my 14 year old and my 10 year old grandsons use this camera with ease, including the movie mode. This does not mean that this is a bottom of the line camera. It is a VERY good camera for any user ablility and age. The down side is that it is almost impossible to find the accessories for this camera. Fortunately mine came with the AC adapter and the case that actually goes to this camera. I have not seen either anywhere online. There is also an optional remote control for this camera but finding it has proven to be unlikely at this time. But still; overall a perfect camera for someone/anyone who does not want to take time to read a manual. I find the camera takes great photographs and easy to use. I just got this camera about a couple weeks ago and I had to call support about erasing the photo's. To my surprise they say it will be a $20.00 charge for help. Now since good money was paid for this camera and a good brand name you think they would help you. Another thing I would recommend using rechargeable batteries as they last longer and cheaper too. I did find out how to erase the photo's. It is a great camera and enjoy owning it. It is not like the old days when an answer could be given freely. You can't register the camera on the web site as it is being discontinued, and information is so old it does not help you. I give the camera high marks for quality. Support 00 in my book. While the picture quality is good (too red actually, but can be fixed with software), there are too many drawbacks to rate it above 3 stars. The battery drain is very high when in photo mode, so using high-drain regular or rechargeable batteries is essential, as regular ones die after only a couple of shots. The built-in flash isn't bright enough, so I'd only recommend it for outdoor use. Manual locking of the battery compartment where SD card is located is a hassle, as is the manual lens cover. Basically, it takes about a minute to get it ready to shoot, OK for prepared shots, but too slow if you need to catch something quickly. Does not come with a charger and rechargeable set of batteries. Also too bulky, especially since you need to carry 4 extra AA batteries, just in case. No webcam, movie mode is OK, but no sound, unlike other 4Mpixel cameras. In this case, definitely, you get what you pay for, maybe even a bit less. 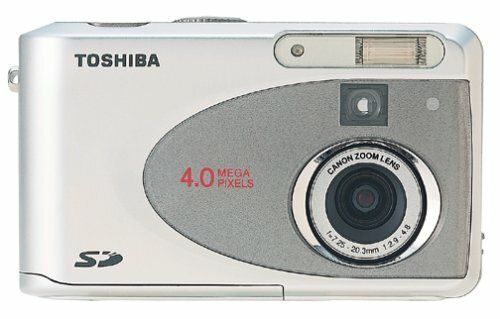 For persons unfamiliar with digital photography who do not wish to be limited to a "point-and-shoot" camera as they learn the digital process, the Toshiba PDR-4300 is an excellent choice. The camera combines Toshiba's superior digital imaging expertise with a high imaging sensor into a camera that is easy to use. After the beginner has mastered "point-and-shoot" techniques, the PDR-4300 with a 4-megapixel resolution and a full set of professional-level manual options, they can readily progress to more advanced digital photography. The camera has a built-in flash and an all-glass quality Canon lens with a 2.8x optical zoom and with digital zoom provides 6x total zoom. The camera has several other features all of which makes for brilliant resolution and excellent photos. Finally, the installation software is "user-friendly" and excellent. The camera battery life is poor. Battery life can be improved by adhering to the camera manual's instructions to turn off the LCD screen and use the viewfinder when taking pictures. However, the buyer should purchase a battery charger and buy rechargeable batteries that have a much longer life. Also, the 16 MB SD memory card limits the camera's picture file capacity and should be replaced by a 32 or 64 MB memory card. Nevertheless, the 16 MB card is adequate during the beginner stage in digital photography. My major criticism concerns the camera manual. The manual is readable, comprehensive and well organized. Unfortunately, the manual, in four languages, is very poorly bound. I had not finished reading the introductory sections before the pages in the English section became unbound. Either the binding should be improved or each language section should be separately bound. The camera is a "best buy", and is lots of fun to use. i just bought the camera, and for the price you won't find a better deal. the resolution is awesome, the flash is bright enough to make low-lit rooms look like there's daylight, and it's easy to use. the manual appears dense, but that's only because it's written in four different languages. the only downside (if you consider it one) is the size. but it appears sturdy, and so far it works very well. i looked at dozens of comparable digital cameras and found this one to be the better deal (cheaper with more features). The Canon EOS-1D brings together the best of both digital and analog worlds of photography. It features one of the largest imaging sensors in a digital SLR, offering 4.15 effective megapixels for stunning, detailed imagery. Significant advances in large-volume data processing technology, a completely new imaging engine, and advancements in mirror-speed technology learned during development of the 35mm EOS-1V all contribute to the EOS-1D's speed and responsiveness. The EOS-1D's newly developed 4.48-million pixel CCD sensor (4.15-million effective pixels) is a full 28.7mm by 19.1mm in size--with square pixels a full 11.5 microsn by 11.5 microns. Another benefit of the large 4.15-megapixel CCD is that the lens focal length factor is only 1.3x. This means your wide-angle lenses will behave similarly to how they do on a 35mm SLR film camera, a huge benefit to photojournalists, commercial photographers, and many other professional shooters. The EOS-1D can record both a RAW image, for optimum image quality and archiving purposes, and a separate full-resolution JPEG file which provides quick access and small files sizes simultaneously. Professional photographers need tools they can depend on in any conditions. The EOS-1Ds body is built of cast magnesium alloy, combining strength, rigidity, and effective magnetic shielding of the electronic components. The EOS-1D is the most extensively protected camera in its class. Seventy-two points on the camera body are specifically gasketed and sealed to protect it even in the harshest conditions, and the NP-E3 battery pack is gasketed as well to protect the battery compartment. Images are stored on standard Type I or II CompactFlash cards, and it is compatible with Microdrives for storage of up to 1 gigabyte (GB). Transfer images to your Mac or Windows PC via high-speed FireWire (IEEE 1394) connection--up to 400 mbps. A beautiful match: The sleek, stainless steel Canon PowerShot Digital Elph S400 in its own luxurious, custom-made Coach leather carrying case. The newest Digital Elph in the Canon's PowerShot line, the compactS400--the successor to the popular S200, S230, and S330 models--is both elegant and powerful. It features a 4-megapixel sensor, 3x optical zoom, an improved 3.6x digital zoom, and movie mode for videos of up to three minutes. A stainless steel shell protects the camera, while a new finish--Super Hard Cerabrite--mixes metals and ceramics to produce a tough cool-toned exterior that is visually stunning. Featuring a 4.0-megapixel CCD sensor, the PowerShot S400 delivers a wide range of detail and color (with images up to 2,272 x 1,704 pixels) and prints beyond 11 by 14 inches. Canon's high-quality 3x optical zoom lens (36-108mm, f/2.8-4.9) allows you to close in on the action, while the 3.6x digital zoom allows for a combined 10.8x zoom letting you capture intimate details that might have been missed with another camera. The PowerShot S400 also features Canon's nine-point AiAF (Artificial intelligence Auto Focus) system for focusing accuracy, shutter speeds of15 to 1/2,000 second, and fast sequence shooting at a rate of 2.5 frames per second (fps). Shoot up to three minutes of MPEG video at resolutions up to 320 x 240 pixels with sound, editing controls, and VCR-like playback. The movies aren't camcorder quality, but they're fun and convenient, and they're perfect as e-mail attachments. The camera can also attach voice memos or sound files of up to 60 seconds to each image. You can select from evaluative, center-weighted, andspot-metering modes depending on the subject matter, and can even choose to set shutter speeds and apertures manually. An ISO range of 50 to 400 ensures practical shutter speeds in a wide variety of lighting situations, while a multifunctional, built-in flash offers a maximum reach of 3.5 meters in Auto ISO mode. 1.5-inch TFT (transreflective) LCD monitor. Built-in flash with auto, on, off, manual, slow-synch, and red-eye reduction modes. Shot modes include manual, auto, and stitch assist. White balance modes include daylight, cloudy, tungsten, fluorescent, and more. Histogram display for checking exposure and contrast levels in images stored on the memory card. Built-in orientation sensor automatically rotates portrait pictures, and these images remain rotated when downloaded, saving time during in-computer image processing. Images and video are stored on CompactFlash memory cards (Type I only) and the included 32 MB card holds approximately 27 images at the Large/Fine setting. Files can be downloaded to either a Mac or PC via USB connectivity, which means it can be connected to any USB-based Windows 98/Me/2000/XP and Mac OS 8.6 or later computer without installing any software. Canon has introduced a series of printers designed to work directly with its lineup of digital cameras. Using these printers, no computer is required--simply connect the camera to the printer and start printing. Printers include Canon's bubble jet direct printers S830D and S530D, and card photo printer CP-100. Of course, photos from your camera can also be printed on any home computer system with an inkjet printer, sent off for online processing, or simply enjoyed on your computer screen. I have had this for 6 months, and use it extensively. I also own a Rollei prego90, and a nikon n70. I love it. its very very compact, and that is a great advantage. it takes sharp pictures and is easy to use. But if you need this for your main camera - i would not advise it. There is no shoe for an add on flash, the focusing and exposure setting time take about a second and a half, so if you need fast pictures, certainly if its anything with action, its not good enough. the batterie eats up very fast, so get a spare one. I purchased my Lumix LC5 for personal use after using one in my profession for displaying enlargements and for publication. After 1300 exposures and half as many prints at many degrees of enlargement I feel very at home with the LC5. What caught my attention immediately was its similarities in appearance to the Canon G series, and a couple of major label 35mm German rangefinder cameras of recent years. Picking the camera up and trying it out in the store I was reminded of the size, weight, and controls of quality traditional film cameras. The Leica name on the lens really sold the camera before I had a chance to see its output. And therein lies the fly in the ointment, albeit a small fly if the user is familiar with post-camera photo editing processes to repair the fault. Clearly, the optics are outstanding. The menus are well thought-out. One can use vitually all kinds of metering methods and achieve wonderful exposures with the LC5. The weak point appears to be the processor which often "overprocesses" the 1680 X 2240 images. The result can be posterization effects in neutral areas, and eccessive "noise" appearing as grain on the monitor at high magnifications. This is especially observed at ISO's of more than 100. I have found however, that there is less appearance of these problems in print output than on the monitor. At times I've had mysteriously underexposed original files that needed post-processing as well. All of this is correctable if one has the time and skill and enjoys doing it. I found that using the 1600 X 1200 resolution setting seemed to clear up almost all of the problems. Perhaps the CCD and processor are really better designed for the smaller files. The problem is, I have a two megapixel camera for the price of a four, if I stick with the lower resolutions. This isn't a problem until enlarging above 5 X 7. So if you're not planning to enlarge much above that, the 2 megapixel solution works. But the question is: do you want to pay for a four megapixel camera that doesn't quite measure up to its competition? For the sake of the wonderful speed, build quality, optics, and camera-like handling, I'm still not too sad about the processor downside. But I might be changing up to another camera a year or two down the road for those really perfect enlargements the competition seems capable of producing at four megapixels and above. If you don't need the "Perfect" camera in this price range, the Lumix LC5 has a lot of things to offer. Boy was I worried about buying this camera. I have read ALL the reviews and there was just enough negative pub to give me pause. But I'd seen Steve Lang's sample pics at a Fry's display and was impressed with its potential, even though he is a National Geographic photographer. I was worried about the durability issue, but then I remember even my Minolta Maxxam 5000 went down on me a couple of times. Well, I saved enough on the camera to buy a 5yr service contract, bit the bullet and bought it, got it home, zipped through the booklet and rattled off a few macro pictures of some cosmos growing in my alley. Holy pixels, Batman, the clarity, the color the beauty of that Leica lens just blew me away. Ya gotta READ the booklet to get the MOST out of this camera, but even without it the pics are simply glorious . . . and that's just the screen renderings! Bear in mind this camera is optimized for PRINTS not SCREENS. I can't wait to print some of these beauties. OK so the built in flash is a bit strong inside, but which one isn't? I was excited to learn you can program it to adjust the flash output, the exposure, saturation, quality and other features. The neat thing is I got GREAT pics without the flash inside with just ambient light. It looks, good, feels good, the big screen is GREAT, the pics are stunning and it is EASY to use. I just looked at a self pic I took last night here in my room with a tripod and the 10 sec delay, no flash and just ambient, incandescent light. The flesh tones are so natural and the definition is so frighteningly clean that my ugly mug almost jumps off the screen. Scary! This is one SCARY neat camera too! I understand it has been discontinued. Too bad! If you can find one buy it! It will impress you! I don't own this one, but after getting a killer deal on a Panasonic DMC-LC40, I dug around a little. This camera here (LC5) is virtually identical with the Leica Digilux1. The Digilux1 is Leica's top of the line for point and shoot digital cameras. The only step up is a CCD backplane adapter they offer for their SLR line, which will cost you (including the SLR body plus lens) the equivalent of a new car! After playing with my LC40, which seems to have the same lens as this one, I have taken shots that I never had from my 35mm SLR set in almost 25 years in the hobby. I would not hesitate to get an LC5 (if I were not already happy with my LC40), as the Leica optics, coupled with the fast action and high resolution Panasonic electronics have a created a combination that blows everything else out of the water! Shopped for a higher megapixel camera for a few weeks - chose the LC5 for the quality optics and ease of use. I am EXTREMELY satisfied! Incorporating a Leica 3x optical zoom lens and a 4.0-megapixel resolution, the Panasonic DMC-LC43 offers professional optics in a classically styled camera at an affordable price. The DMC-LC43 also features several automated scene modes, video capture with sound, and ArcSoft image editing software. The DMC-LC43 captures images up to 2304 x 1728 pixels for 11 x 14 inch photo-quality prints. Other resolution modes include 1600 x 1200, 1280 x 960, and 640 x 480. The 3x optical zoom is joined by a 3x digital zoom for a 9x total zoom. 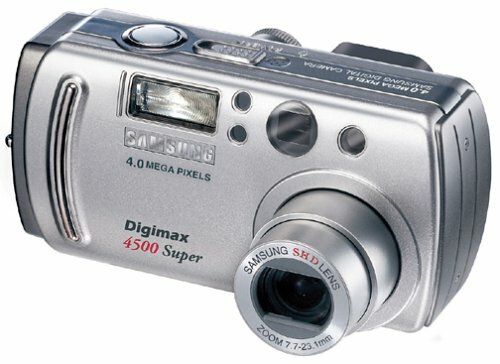 In addition to taking still photos, the DMC-LC43 can also record 320 x 240 movie clips at 10 frames per second with audio. Your video length is limited only by the size of your memory card. The Mega Burst Imaging feature allows you to take consecutive pictures at an incredible quick rate, making it perfect for capturing fast-moving objects in high resolution. You can then view your shots on the camera's LCD screen to choose the shot you want and delete the rest. The Lumix DMC-LC43 features a Mode Dial that gives you a variety of settings to choose from to help give you the best shot possible based on your shooting environment. Modes include simple, normal picture, macro, portrait, night portrait, motion image, landscape, and playback (which lets you view images in a slideshow format on an SD memory card). The Venus Engine LSI generates the luminance signal of the primary color CCD using all three colors (red, green, blue) for improved diagonal image resolution, compared to conventional CCDs that use only one color (green) to do so, resulting in rich, expressive images. This LSI also handles image processing, LCD functions, and writing to the memory card concurrently, for an overall quick camera response. Images can be stored on the included 16 MB Secure Digital memory card; the DMC-LC43 is also compatible with MultiMedia (MMC) cards. Images can be downloaded to either a Mac or PC via ultrafast USB 2.0, which means it can be connected to any USB-compatible Windows Me/2000/XP and Mac OS 8.6 or later computer without installing any software. When used with USB 1.1 connection, transfer will slow to USB 1.1 rate. The camera is powered by 2 AA batteries (alkalines include, rechargeable NiMH batteries recommended). It measures 3.8 by 2.6 by 1.3 inches and weighs 7.6 ounces (excluding batteries). ArcSoft PhotoImpression: Adjust colors and process images to create calendars, cards, etc. SD Viewer for DSC: Makes it easy to check image data on an SD Memory Card. Use it to create slide shows and save them on an SD Memory Card (for Windows only). The camera is easy to use and takes beautiful pictures, but after four months it just stopped working. There was power, but the lense would not open. The Panasonic Service Center was anything but helpful and wanted to charge 75% of what I paid for the camera to fix it. I am now shopping for another digital and I shall not be looking at a Panasonic. Just to try this thing out when I got it, I took a picture of some print across the room (20ft away) that I can't read with my eyes. I could read it in the blowup of the image. If I can see things in the photo that I can't see with my eyes, the resolution is 110% fine for snapshots. The color balance and exposure isn't perfect, but it's close enough that you can fix it with Photoshop without too much work (autolevels does the job usualy). Battery life with the included rechargeable AAs is sufficient for my needs. You'll need a better memory card, though, as the included 16mb job only holds ~13 pictures. It is good that it uses SD, which is a standard, rather than the proprietary MemoryStick that most of the Sony cameras use, so you can find a 256mb card for under $60 if you look around. I was hesitant to buy a digital camera because I am know very little about film camera and nothing about digital. The amazon reviews for this camera were an enormous help in comparing with other brands. Ordered this camera from amazon reseller for &260 plus $5 handling. The reseller shipped in 2 days and I had the camera in 5 standard shpping days. It was advertized excellent condition, used. It arrived in pristine condition, not a mark on it with all in original unopened packaging. Used the quick quide to take some photos and learned how to review pics on the lcd in about 1 hour. The manual is sparse on instructon and does tell you everything you need to know if you follow step by step in using the features and in downloading the pics to your pc via usb cable (supplied with camera). The photos are clear and crisp with excellent colors and detail. I was delighted at how easy it is to take motion film with audio. Camera is compatible with my pc programs: lexmark printer/software; photoshop and paintshop pro software; generic microsoft photo software. I have 20 photos with 4 10sec. motion clips on the 16mb card that came with the camera. Will order a 128mb card for a trip upstate which will store lots more photos. The AA batteries drained after shooting pics for 1 afternoon and then downloading photos to the pc that night. Am buying the dc adapter for downloading. Will be using the supplied rechargeable batteries for the trip (with couple AA batts just in case) For the money, am very happy the camera performance and ease of use. Read the prior reviews, they are on target. Camera light enough to put in your pocket, but subtantial enough in design to feel good in your hand when taking photos. Would give 5 stars if panasonic had supplied the dc adapter (I would not mind paying the cost if it came with the camera, am annoyed at having to take time to buy it extra. It does not make sense to waste battery life in downloads to the pc). I purchased this camera 6 months ago and took less than 200 pictures on it. The shutter broke (of course in the middle of an event that I really wanted pictures). 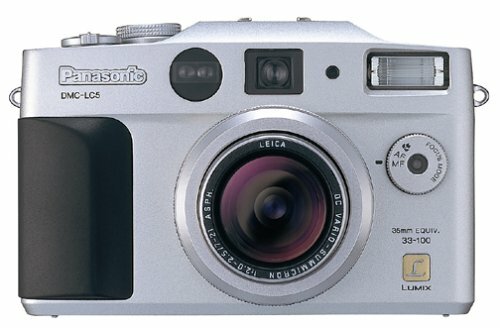 Sent the camera back to Panasonic and it cost over $100 to repair. Customer service said, "we can't guarantee every product we make is going to work, we'll split the cost of the repair for you." Ironically, I was going to buy the panasonic rear projection LCD TV, but after this experience reconfirmed that SONY is the only way to go. Good things: I previously got an Olympus....and this one was great...great price, great quality photos....and most important: easy to use. I mean I popped it out of the box and in a half hour had loaded all the software on my computer, took pictures, sent them by email and set up a slide show on my tv (the easy av thing is cool...sort of like a slide show back in the day in your folks' livingroom...). I also liked the battery life. 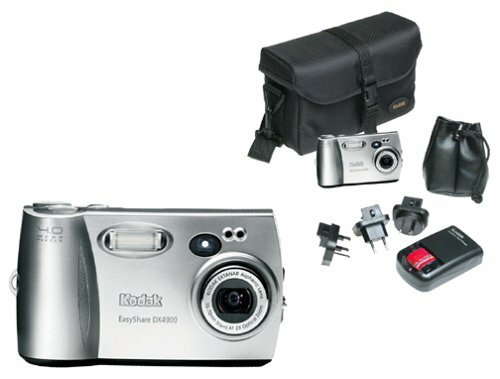 The Kodak DX4900 builds on the success of the EasyShare range, bringing 4.0 megapixels and a whisper-quiet 2x optical zoom lens to this easy-to-use and extremely affordable package, which includes the handy Kodak travel kit for DX EasyShare series cameras. The travel kit contains carrying case, battery pack, and charger. The padded carrying case has been custom designed to protect your camera and provide you with ample storage for accessories. The battery pack features two AA NiMH rechargeable batteries. The convenient battery charger can charge these batteries in three hours or less. It also comes complete with U.K., European, and Australian plugs. The DX4900 is essentially an update to the successful 3-megapixel DX3900, with a new 4-megapixel CCD capable of producing good poster-size prints. Indeed, the camera was named best point-and-shoot digital camera in its price range at the 2002 Photo Marketing Association Awards, based on color accuracy and image and print quality. This is important, because the EasyShare range of digital cameras, while not among the prettiest available, perform extremely well against the competition and at the same time offer extraordinary ease of use. The DX4900 is, in fact, as easy to use as a compact film camera. Picture taking is as simple as loading the CompactFlash card and the battery and setting the date and time. From there, the camera operates in auto mode and takes pictures with excellent color balance in most situations. Should the need arise, the camera can be set to override the ISO settings from 100 to 400, shutter speeds from 0.7 to 16 seconds, sharpness, metering, resolution from 1 to 4 megapixels, color settings, white balance, and exposure compensation from -2 to +2 in 0.5 EV steps. Despite the ability to set these, we feel that this camera performs such a good job of image capture in the auto mode that you will rarely have to alter these settings. PROs: The picture quality is excellent and rock!. The camera's firmware and software interface are great. It is really high tech speaking for its electronic and servo/mechanical systems. The Kodak software (download the latest!) is very friendly and does the job. The photos can also be accessed via a DRIVE LETTER in MS Windows..just like another hard-drive or so.. then remove it without having to un-mount the device.. just unplug the USB cable (no docking station yet for me).. The camera's weight is ok.. The travel kit is nice to have..
CONs: The speed (next shot) problem remain though with digital cameras regardless (I'm using a 256MB Compact Flash). You will have to wait for more than 5 secs in 4MP mode to get the next shot. 2.2MP mode is still slow. It seems that the camera to memory interface is the problem regardless of the brand/make.. I have 2 digital cameras and they are the same.. Overall, this is a great toy for getting excellent photos.. just do not expect to capture many shots of a super sonic UFO.. You get one shot... or maybe two.. I bought this camera 3 weeks ago from Amazon (new) with the travel kit. Initially I was looking for a good 3 MP camera but when I looked at this one with great price tag, I couldn't resist. I must say I am impressed with various features it offers for the price. Ok, if you compare with other higher priced 4 MP cameras, it may not offer some of the advanced features but ask yourself if you are ever going to use those features. Todate I have taken more than 100 pictures, with various settings & I must say they are amazing. Camera is easy to operate & LCD, although relatively small, is very clear. Also, I still have not changed batteries even after using LCD screen for most of my pictures, so I don't understand the fuss about digital cameras eating too much battery. I would highly recommend it to anybody looking for camera with more megapixels for less price and easy to operate. I am not a professional photographer and never will be. My life is very active and I needed a camera that is simple to use. If you are looking for a camera that will take beautiful pictures and not have to read the whole manual before to do it, this is the camera for you! The menu is very easy to use and it is a great point and shoot camera if you don't want to mess with changing everything. This camera has been used sometimes daily because I also list on Ebay. The 4.0 megapixels really give it that extra boost in quality pic taking. 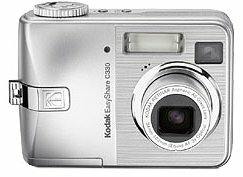 I also have the Kodak DC3400 and this was an upgrade. Both cameras are great! This is a good solid camera. I dropped it on the gravel (with the lens open) right off the bat, but other than a small ding and some scratches, the camera still works great! The picture quality is excellent and it's easy to use. The one button dock is super easy to use and charges the batteries at the same time. The only reason I am not giving it a 5 star rating is because few of the pictures taken at school functions have not turned out well at all - those pictures are dark and fuzzy. I think it has something to do with the red-eye setting on the flash, since that's the only time we have used that funtion and all other times the pictures are generally very high quality - some are incredible. We bought a 128MB memory card at the same time, which is definately the way to go - we have only filled it up once and had to use the 8mb card that came with it for additional pictures. Great camera when it comes to photos or price but the international charger does not work up to expectation. It like a conventional charger does not completely charge the battery, rather it switches off just after 10 minutes or so and you gotta manually start it up again (for another 10 minutes...) . The manual mentions that slowly this 10 min thing will increase....but what the hell!! 4.1 megapixel sensor creates 2,320 x 1,744-pixel images for photo-quality prints at 11 x 14 . 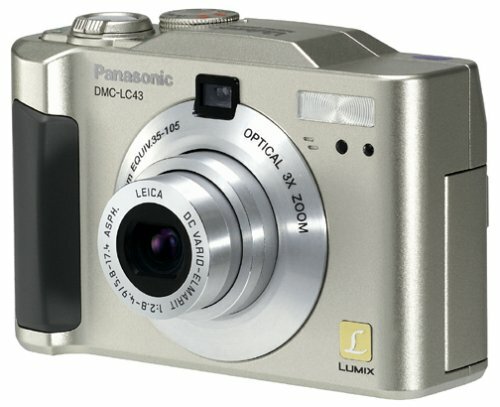 The 4-megapixel Panasonic Lumix DMC-FZ10 offers a host of professional features at an affordable price. It includes a 12x optical zoom with image stabilization, full manual controls (with a manual focus ring), a hot shoe accessory connector, and movie mode with audio. This Lumix model (the DMC-FZ10S) has a silver body; the DMC-FZ10K has a black body. "What kind of camera is that?" is the first thing everyone says to me when they see this camera. This is the only camera I have had that people immediately write down the model number to go get one for themselves. You can see from other reviews, the owners of this machine are smart people who have done their research. I have now sold several photos taken with this camera. It's lighter than it looks, it handles like my 35mm, it is easy to use right away and as I get better with it the images are getting better and better. We all send pics via email. The response is usually "cool pic" or similar. Now it is "wow! what a great shot!" The battery life is the best I have ever had. I can fill a 256mb card and the battery meter still shows full charge. The bad? It won't fit in my pocket. I finally decided to take the plunge into digital cameras after by two faithful Pentax's finally gave up the ghost. I did a lot of research looking for a camera with the right combination of quality, features and price. Having used other peoples point-and-shoot camera's I was disappointed with AF ability, and wanted to ensure I had a manual focus override - the FZ-10 has it. I also do a lot of sports photography, so I needed a camera with shutter-priority - the FZ10 had it (in addition to aperture priority and fully manual options). I also needed a camera with a reasonable f range, and the 2.8-8 available with this camera met my needs and seems better than most others. Finally the 12x optical zoom with image stabilization means I no longer need to carry a bulky 400mm lens and tripod. I have only had the camera a week and already love it. The color rendition is superb, the exposure bracketing works really well, the macro produces superbly sharp pictures, the image stabilisation really works and I have enlarged pictures up to 10x8 with no noticeably digitization. In fact, I believe the quality of images I am getting are better than with my old film camera. The spot-focus mode is tremendously useful for portrait work. Of course I do have a few gripes. (f) The lens cap is not attached and I suspect I will lose it. Others complain about the fact that you can't access the SD card and battery if the camera is mounted on a tripod. This is true, but I also found the need for a tripod much reduced. I have not had a chance yet to try it out in low-light conditions, but I understand this can cause problems. i've give this camera 8 starts if it was possible. This is an amazing camera. I have been researching what camera to buy for the last few months! and I haven't found a camera that comes close to this one. First of all the camera is big, so if you want a small zoom camera this isn't it. 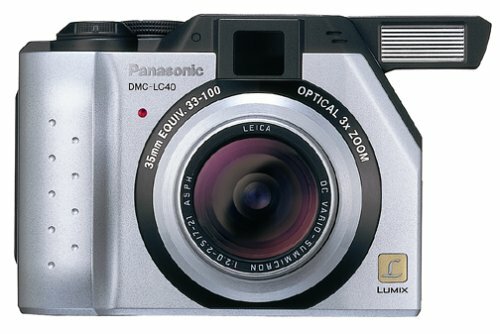 I'd recommend the Panasonic DMC fz1 or the Olympus C-750 models. This camera comes the closest to perfect for me and what i've wanted in a camera. (1) leica lens (fyi leica makes $2000 cameras, so for this camera to have a leica lens, it's got to be good). (2) the camera has auto and manual focus, and auto and manual modes so u can either point and shoot or learn to take pix with the more advanced features. (3) movie mode is very descent and it has good sound. (4) has a 16:9 ratio for 1 photo size (quality) setting, so u can take a pic and it'll be in widescreen...cool huh? (5) all the modes on the dial, portrait, night portrait, panning (makes a moving object in sharp while the background is blurry), sports, macro. (6) battery life is good. lasts pretty much all day. (7) has this cool flip animation, you can make movies with ur clay figurines, if you'd like!! take a pic of a figurine and move it slightly every time and when done itll convert it into a quicktime movie. (8) of course, the super ultra yummy zoom! how could i forget that? that's what got me interested in the camera in the first place. (9) aperture range of the lens is f2.8 throughout the focul range from wide to telephoto. (10) menus are easy to navigate and quick. (11) can use conversion lenses for wide and tele. (12) burst mode, can take 4-5 pics quick. (13) histogram on play and record mode - good for composition measuring. (14) turns on in about 2-3 secs after getting lens ready. (15) great photo quality!!! which is the most important thing!! (1) of course, price.......but ah well...shouldn't be a con, nice things cost money! (2) i found that you cannot thread filters to the lens (lens not threaded) so can't protect lens with a (for example a UV filter to leave on permanently.) But can thread filters (72mm) to the lens hood (the camera package includes) which attaches to the lens barrel, (lens hood) roughtly 2-3 inches wide. (3) and the movie mode.....cant use the zoom!!!! wonder why!?! (4) extra batteries are expensive, and hard to find at ur local store. despite these 4 cons i have found in the last 3 months of researching for the perfect zoom camera, this has gotten to the closest i've found. Also, get a SD card at least 256megs or larger and start shooting away!!!! THIS CAMERA IS A SUPERB INVESTMENT. I purchased the Lumix FZ10 after I returned a Fuji 3.0 megapixel which supposedly pushed resolution to 6.0. I have developed pictures from both cameras and there is no comparison. This camera truly outperformed all of my expectations. There are many options to push your experience into the "professional mode" which I have not even tried yet. I have not had this for a week and yet have many excellent pictures which I have shown off to friends and family. One problem I have had with all cameras is trying to get good pictures of my ragdoll cats without red or irredescent eyes. I captured their big blue eyes and did not even use the red eye reduction feature. The flash angle is perfect to impart a professional quality to your photos. It is true that the lens cap is not attached, but if anyone passes this camera for that reason they are truly missing out on a great opportunity. I feel that my pictures compare with Canon T70 which I used for years. 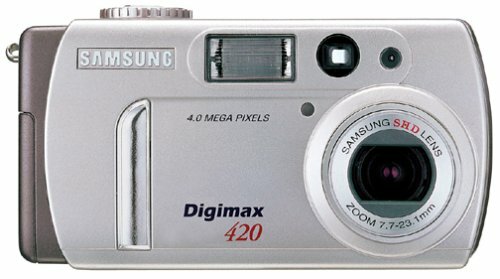 If you research this camera at the digicam review sites, they all agree that it is an excellent buy. One very important feature on this camera is the optical image stabilizer. I took some existing light pics which should have been taken with a tripod and yet they were perfect because this camera stabilizes camera shake so well. I expect to keep this camera for many years. Don't let the 4.0 megapixel make you pass this up. By adding the Leica lenses, the image quality is superb and may surpass many higher megapixel cameras. I am looking forward to trying many of the added features soon. I know I will not be disappointed. Wow! Finally an affordable camera with MORE features, functions and image quality than my old 35mm SLR camera. At about $550 this has to be the best semi-pro camera around. The specs are impressive, but the ease of use brings the full potential to your fingertips. While it can take great pictures as a point-and-click camera - easily beating the Canon G3-G5 - the real power comes when you begin going manual. Conventional wisdom holds that you should buy a digital camera from an established film camera company. Well, this camera combines the excellence of a lens/camera company - Leica - with a great Electronics Company - Panasonic - the best of both worlds! For a sound byte: The Lumix takes GREAT pictures! The lens is an incredible 12x optical zoom (equivalent to 35-420mm 35mm) that works well at both ends of the range (yes it does have a bit of chromatic aberration at full zoom, but only at a 200% blow-up on the screen). The macro works down to a few inches! The lens is rather fast for the zoom - f2.8 and the equivalent ASA is 50 to 400. So a good lens, a good sensor, then comes the really great part: the electronics. I wish they had more controls on the compression - less compression would be nice since in low light the compression artifacts do show up. 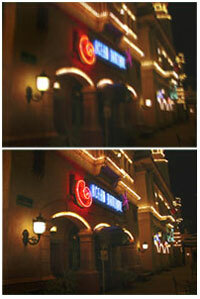 The 4MPEL image sensor really seems to be a good capture device. Bottom Line: For a serious amateur, this is a great camera. For a pro, this might take the place of many SLR's. An real amateur can go all automatic and get great pictures and have room to move to better pictures with manual later. It doesn't fit in your pocket, but it takes great pictures!